What’s the difference between the Emotion and Body Codes? Working with the Body Code and the Emotion Code modalities have completely opened my eyes to the endless communication we can have with our subconscious mind. This complete communication can help us uncover exactly what we need to do to completely balance our own body so it can function properly. While you can search my website for extensive information on what the Body and Emotion Code actually are, it dawned on me that I really haven’t defined what make the two different modalities unique from each other, and whether one is better than the other. The emotion code has two basic purposes, releasing trapped emotions, and removing heart walls. As we go through life we experience traumas, setbacks, and disappointments. Without taking appropriate steps, these negative emotions can hang around us and can create other negative outcomes in our lives. 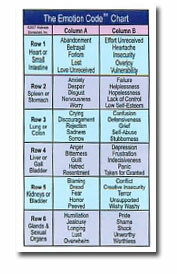 These negative emotions can also come, at no fault of our own, from our ancestors. For example, let us suppose that your great grandmother suffered from some type of emotional trauma, if she never had the opportunity to get rid of that emotional trauma, it can be passed down to you. Additionally, negative emotions can be simply absorbed from our environment. My husband’s job can be very stressful, and is a hot bed for negative emotions. Just by being in that environment, he brings home these negative emotions, and we have to go through and clean them out. Like an annoying houseguest, negative emotions never just go away on their own; the Emotion code gives you the tools to evict them from your life. Another very important aspect of the emotion code is the removal of your Heart Wall. To best describe the Heart Wall let me use an example. My daughter came home from school heartbroken; her friends decided they didn’t want to play with her anymore. As her Mom, I knew that she has to experience these things. However, I wanted to just envelop her in a super thick layer of emotional bubble wrap to protect her from ever feeling this pain again. Our subconscious wants happiness but, like my daughter, we all have to feel pain and heartbreak. To protect us we build layers of emotional protection called our heart wall. While this protection helps us stay emotionally protected from the negativity that surrounds us, it can prevent us from feeling a full measure of joy, and creating deep emotional connections with those we love. Negative emotions want you to fail, and they will hang around your subconscious self constantly sabotaging your life. You will feel amazing after using the emotion code tools to clean out the years of negative emotional baggage weighing you down. 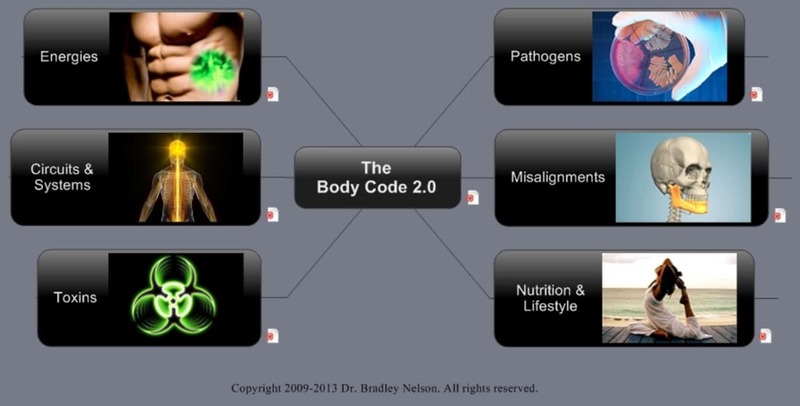 The Body Code is a much deeper, more complete system of healing. In fact the Emotion Code is just a small piece of what the Body Code can do for you. The Body Code builds on the good work done by the Emotion Code by not only removing the negative emotions holding you down, but the Body Code identifies and removes all negative energies and addictive tendencies holding you back. Additionally, the Body code removes physical toxins, like pathogens and heavy metals from you. Our bodies can act like a sponge absorbing all matters of nasty stuff from around us; the body code can both remove these parasites and protect you from the negativity of your environment. As I began using the Body Code, I was shocked at how often the toxins and a person’s stress came from fluorescent and electromagnetic fields. Think about it, how many hours a day do you spend under fluorescent lights, and how often are you using your cell phone? These devices can do damage to you, Using the body code, we can protect you. The best thing about the body code is that it is like your chiropractor, physical trainer, green smoothie cleanser and hypnotherapist all in one. It aligns your energy chakras and medians, and realigns physical misalignments in your bones, organs, and body systems. The body Code looks at health from all angles, and opens all avenues of communication between you and your body, so your body can properly communicate exactly what it needs to experience full health. Additionally, the Body Code system can remove the mental blocks holding you back from feeling happiness. When I work with you, I use both tools to identify why your body isn’t experiencing the best possible health , and I remove all barriers keeping you from achieving it.